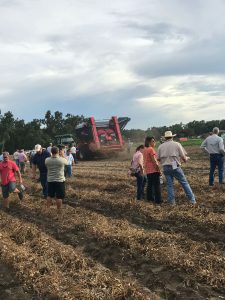 The inaugural UF/IFAS Extension Peanut Harvest Trade Show and Field Demonstrations took place on August 21st at the North Florida Research and Education Center in Live Oak, Florida. 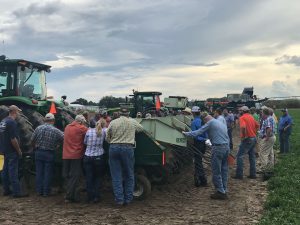 The event provided a review of techniques to improve harvest efficiency focused on peanut plant inverting, harvesting equipment adjustments, and maturity evaluation. Various UF/IFAS Scientists and Extension faculty were present to facilitate the program. Representatives from the manufacturing companies KMC, Amadas, and Colombo were also present to offer tips on getting the most benefit and precision from their equipment. 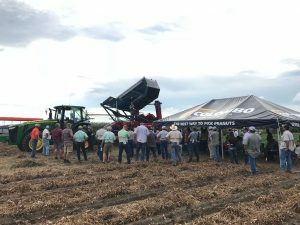 During the demonstration portion of the event, these companies were able to educate producers by showcasing various features of the equipment which will help them enhance yield and reduce waste at harvest. Other event highlights included a core and private pesticide license training with CEUs for pesticide handlers, and a trade show of vendors. The trade show component had 22 vendor participants and offered various giveaways and door prizes. The Florida Peanut Federation sponsored a barbeque supper for the attendees. Local FFA and 4-H youth passed out boiled peanuts and Elmhurst’s new peanut milk product for sampling. Overall, this was a successful and popular first-time event with approximately 170 attendees and vendors present from across the North Florida region. For more information on upcoming UF/IFAS Extension program opportunities, contact your local extension office for a calendar of events. Producers selected the digging station that matched their equipment needs. Seen here are local producers at the KMC station. Attendees were able to learn about new equipment technology and view the harvester performing first hand. 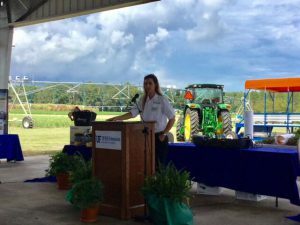 The program included educational demonstrations on topics ranging from peanut maturity evaluation to equipment harvest efficiency. These topics were all geared towards helping producers reduce yield loss at harvest. Part of the attendees gather at one of the equipment stations to learn about key features of the technology. My background is in commercial row crop farming. My education is in Plant Science from the University of Florida.